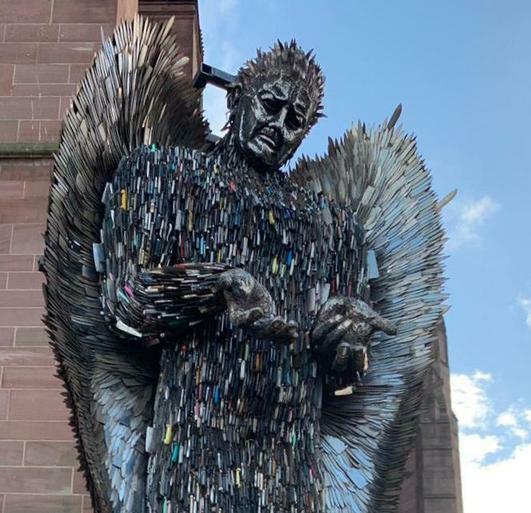 A 27-foot-high sculpture, made of more than 100,000 knives, has been unveiled outside Liverpool Cathedral. Created by artists Alfie Bradley, at the The British Ironwork Centre, the monument is a memorial to those whose lives have been affected by knife crime. The Knife Angel took over a year to build and is made up of thousands of knives confiscated from 43 police forces across the country. It will be outside Liverpool’s Anglican Cathedral over Christmas until January 31, 2019.